Pool alarms and sensors can act as electronic safety and security measures for your pool although, where children are involved, they should not replace constant supervision. The need for pool alarms and pool safety measures. In some countries and parts of the world there is legislation that demands for pool safety measures such as alarms, safety covers and pool barriers but there is no such legislation in the UK. The fact that there is no law regarding pool safety in this country doesn’t make the need for pool safety any less serious. Drowning is the third highest cause of accidental death for children in the UK. Not all of those tragedies occur in swimming pools but it is really unacceptable that any do at all. 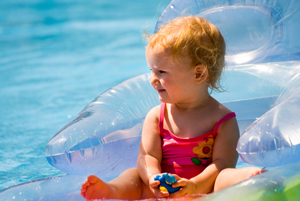 Children should never be allowed in or near a pool un-supervised but even with supervision, accidents can happen very quickly. A person can be drowning without it actually looking like that is what is happening until it is too late. Teaching your children to be competent swimmers as soon as possible is one of the best safety measures you can take. Electronic sensors can raise the alarm if someone enters or approaches the water but they should be used in addition to other safety measures and practices. Alarms and electronic sensors for your pool. Alarms and electronic sensors can act as safety barriers for your pool as they can warn you when children or others approach the pool or enter the water. Alarms can be placed around the pool or they may be in-pool devices. In-pool alarms float on the surface of the water and react to movement or even changes in surface tension. They emit a loud signal whenever the water is disturbed. Of course, the alarm can be turned off when the pool is being used and any children have adult supervision. Other alarms attach to the side of the pool and have a sensor that sits beneath the water surface, which detects changes in pressure that would happen if someone were to fall into the pool. A third option, specifically aimed at children, is a wristband that includes a sensor that will react to total emersion in water and, once again, sound an alarm. The first two alarm types would work equally well for pet owners who were concerned for the safety of their animals. There are pros and cons to each of these three main types of pool alarm but it should be stressed that they should all be seen as an addition to physical barriers that prevent children getting into your pool when you are not there to look after them. Other forms of electronic pool security. If the pool is indoor or a fenced and gated outdoor pool, then the door or gate can be alarmed. These alarms will sound a siren either at the gate or in the home if the door is opened and need either a key or digital key code to open the gate without setting off the alarm. It is also possible to surround a pool with infrared (IR) security beams that would be broken by someone moving towards the pool and trigger an alarm. Although they don’t act as an alarm, a final form of electronic pool security would be automatic pool safety covers and, perhaps the most modern and secure of all, a pool with a moving floor, which rises up to sit above the water and completely seals off the pool. We hope this article has been of use to you. There are many more articles on this site that will give you information on almost every aspect of your pool. If you would like to add a comment to this article then please use the reply box below. The latest thing in LED pool lighting.